It is a password vault. Progs like KeePass do the same thing even better for free. Not really anything really innovative here in fact it seems a step backward. This program isn't 100% free. 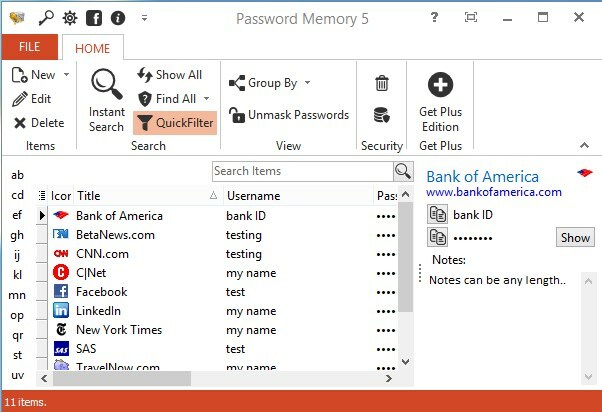 KeePass does everything the Plus version of Password Memory does for free. Don't waste your money on this. If you want a high quality free password manager go to "www.keepass.info"
The software worked well for me, though I must say it has limited uses. you have the option to create a new one when you start using the program (option "click here to create a new database"), but it keep saying that "database name is missing." ... shame, the picture of the gui looks interesting and this is all I was able to see from it. This software looks pretty good, and somewhat easy to work with - yet I would not pay money for such a program. I'm in the process of developing my own password manager, called Hushkey. It's not the best, as it is designed to be simple. It's freeware, and will remain that way. This is very comparable to KeePass except I found Password Memory 2009's icon creation and grouping unnecessarily complex. Compare both programs and you'll see what I mean. Security is basically incredible for any program of this type. I uninstalled this and went back to KeePass. With KeePass being free and meeting all my needs I wouldn't buy any program of this type, but I thought I'd compare a few just to be sure. @po4ko: Maybe because I don't want critical info such as passwords in an open source database? 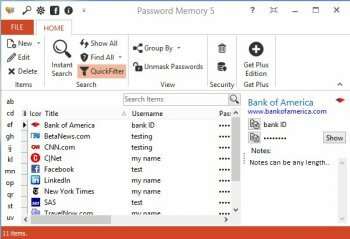 Why would anyone want to give their $20 away, when there is the king of all password managers - KeePass. Is is free, open source, multiplatform, and you can copy its installation on an USB stick with your database, even without getting a separate portable version, which is also there. So why do I need to give my $20 away, for something that I can get for free and which is better anyway? I got the program (and database) installed on my USB stick. So I carry it with me wherever I go. Cons: appears to save passwords and user ids. nothing else. no form filling - web or otherwise. does not appear to provide any way of organizing passwords. Everything stored in one big honking list. No folders. Bottom Line: It is a password vault. Progs like KeePass do the same thing even better for free. Not really anything really innovative here in fact it seems a step backward. Portable version, please! Great app - nice and simple.